Deadlines. In general, the copy deadline for each issue is the Friday 10 days in advance of the Monday cover date. The deadline for the Bulletin that covers Oct. 18-31 is Friday, Oct. 8. A complete publication schedule is available at <deadlines> or by calling (609) 258-3601. Princeton NJ -- In an age when many scientific discoveries result from the infusion of ideas from one discipline to another, faculty members at Princeton have created a unified science class for freshmen that breaks down barriers between fields without sacrificing depth of knowledge. Weekly lab sessions are an important part of a new course that integrates biology, physics, chemistry, computer science and mathematics. Under the guidance of Lewis-Sigler fellow Maitreya Dunham for the lab component, Sandhya Sinha (left) and Christian Millian (right) are two of the 35 freshmen taking the full-year, double-credit course taught by eight faculty members who cover subjects ranging from genetics to quantum mechanics. The course, offered for the first time this fall, puts Princeton at the forefront of nationwide efforts to rethink the way the sciences, particularly biology, are taught to undergraduates. Under the leadership of David Botstein, director of the Lewis-Sigler Institute for Integrative Genomics, faculty from chemistry, computer science, molecular biology and physics have teamed up to create a single course: “An Integrated, Quantitative Introduction to the Natural Sciences.” The full-year, double-credit course meets five days a week and spans subjects from genetics to quantum mechanics. 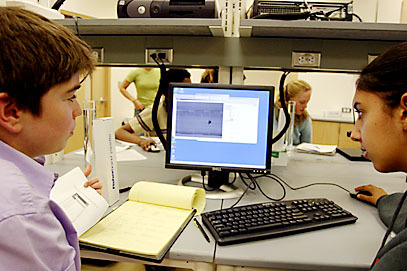 Traditionally, students interested in the natural sciences and engineering take some combination of freshman-level courses in biology, chemistry and physics. Rather than following the conventional curricula of those disciplines, the new course is organized around fundamental concepts and computational techniques common to all of them. At the same time, it fulfills the prerequisites of advanced courses that build on the conventional introductory classes. Botstein plans to follow the freshman course with a full-year sophomore series that continues the integrated approach. Freshmen in the new science course measure the acceleration and drag of falling objects. A variant on the classic physics lab involving blocks sliding down a slope, this lab measures balls falling through a liquid, which more closely resembles experiments in biology. TOP: Rebecca Allen prepares to drop a ball bearing into a liquid. 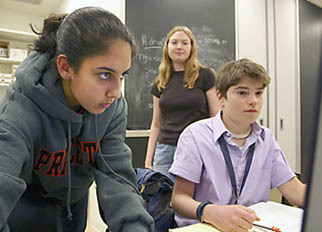 BOTTOM: Christian Millian and Sandhya Sinha analyze an image of the falling ball. That belief is shared by leaders in the field of biology, including a panel called BIO2010, appointed by the National Academy of Sciences, which recently issued a stern critique of undergraduate biology education. The 11-member committee, which included Princeton biophysicist John Hopfield, contrasted the profound transformation that has occurred in biology  driven by biotechnology, genomics and computing  and the lack of change in the way the subject is taught. Developing such a course was a priority for Botstein when he came to Princeton from Stanford in 2003. He gathered a core group of interested faculty members who met every Monday for a year to plan the curriculum. Despite a few bureaucratic hurdles in making sure the course met certain requirements for each department, the planning went well and the course was ready to debut a year earlier than Botstein had imagined. “We have gotten a huge amount of cooperation from the departments and the University,” said Botstein, who noted a “pent-up demand” among faculty members for new ways to approach their subjects. The course is co-taught by eight faculty members, two from each of the four participating departments: Botstein and Eric Wieschaus from molecular biology; John Groves and Michael Hecht from chemistry; Bernard Chazelle and Olga Troyanskaya from computer science; and Daniel Marlow and William Bialek from physics. In addition, two recently appointed Lewis-Sigler fellows from the genomics institute, Maitreya Dunham and Will Ryu, lead the lab component. Marlow, chair of the physics department, said he participated because the course offers an opportunity to give physics students an alternative to the highly quantitative and theoretical approach that dominates teaching in his department. “My personal experience is that there is another way to learn physics,” said Marlow, noting that many students would benefit from more emphasis on the application of physics to a wide variety of intellectual and real-world problems. Chazelle, a professor of computer science, said the course also introduces students to important new directions in his field. The use of computers has long been important to many areas of science, he said, but has lately moved from simply being a tool to becoming integral to the intellectual substance of other disciplines. Biologists looking for creative ways to analyze reams of data from the human genome, for example, are working on the same problems that engross many computer scientists. “We are starting to have a dialogue back and forth that really did not exist before,” he said. The confluence of disciplines occurs most dramatically in the course’s weekly lab sessions. 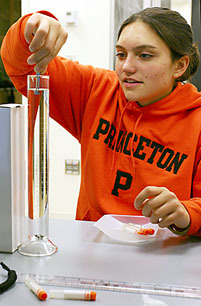 The second lab assignment, for example, brings elements of mathematics, chemistry, computation, physics and even electrical engineering into the classic biology problem of measuring the growth rate of bacteria. The lab, which takes six weeks to complete, starts with students using calculus to model the exponential growth of bacteria. They then learn to grow actual bacteria and use a microscope to measure how they multiply. Next, to explore a more automated approach, they use soldering irons and common electronic components to build a detector that measures how much light is absorbed by the bacterial culture, which indicates the density of the population. In the process, they learn about the physics of light and optics as well as absorption measurements that are commonly used in chemistry. The skills students learn will put them “within a hair’s breadth of doing actual research,” Botstein said. Lab leaders Dunham and Ryu, who earned their Ph.D.s last year, see the course as a way to re-examine the educations they just completed. “I wish I had a class like this when I went to school,” said Ryu, a 1994 Princeton graduate. A physics major, Ryu did not “discover” molecular biology until his junior year. “That was three years late,” said Ryu, who went on to earn a Ph.D. at Harvard before returning as a Lewis-Sigler fellow. For the 35 students taking the course, hindsight was not necessary to see its value. Botstein had planned to limit the class size to 28 and required interested students to submit an essay. He was gratified when many more applications arrived from students who were not only well qualified but grasped the purpose of the course. Botstein couldn’t bear to turn any away and expanded the enrollment. Freshman Sandhya Sinha, who is contemplating majoring in physics, simply wanted a course that emphasized the similarities rather than the differences between the various fields, all of which appeal to her. “Essentially, I took this class because I really like science,” she said.